1.5 miles from Pharmakonisi island (near Leros island) a fishing boat, transporting undocumented immigrants, capsized today. 16 immigrants have been rescued and 12 are reported missing (9 children and 3 women). The dead body of a young child was discovered yesterday in the river Ebros, near the village of New Cheimonio. The unlucky boy was probably one of the sans papiers immigrants, who were carried away from river waters and found dead in the region of Dilofoy – Marasion, a few days ago. The corpse, in advanced decay, was discovered by a fisherman, who notified the Police. Afghan refugees in Greece on the Patissia bomb explosion. Yesterday, Wednesday 31, at 8:00 pm circa 200 Afghan refugees made a silent and peaceful protest in front of the Greek Parliament in Syntagma Square, lighting candles and honouring the 15 year old Afghan refugee’s memory (traditionally) on the third night after his tragic death . This is a translation of the text calling to the protest. The original text has been posted at http://athens.indymedia.org/front.php3?lang=el&article_id=1149594. 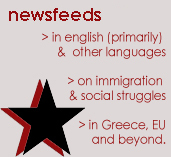 As athens indymedia users have reported this critical text was not reported by mass media and mass circulation newspapers. More on the case of the victims of the Patissia bomb explosion: http://libcom.org/news/boy-dies-athens-mystery-bomb-30032010, http://athens.indymedia.org/front.php3?lang=el&article_id=1149778. We choose a silent protest, not because we are not hurt by the unjust and tragic loss of our innocent fellow Afghan, who perished just as bad as he might have perished in Afghanistan, if he had not fled the country with his family. If we choose a silent protest, its not beacuse we are not angry with the state of refugees in Europe in general and especially in Greece. Its not as if we are not angry with the medieval conditions at concentration camps of refugees and immigrants, which entrap our children and our families; its not as if we are not angry with the daily opppressive treatment in the street, in squares, in our homes, in government services for foreigners, for all we are subjected to for the crime of being refugees. We choose a silent protest because we respect our fellow man who died, and we protest against the conditions he lived under with his family as refugees. We respect his family, especially his mother, a woman who experiences the shock of the tragic loss of her son and probably the loss of her daughter’s sight. And finally, we respect the Holy Week and Easter holiday period of our fellow citizens in the country that “hosts” us. All those that the corporate media and the government institutions did not observe by ridiculing all human dignity and by encroaching and violating fundamental human and refugee rights respectively. Najafi family with the tragic loss of their 15 year-old son and the loss of her 11 year old daughter’s sight in the bomb explosion of March 28 in Patissia adds to the long list of victims of the Greek-European inhuman and repressive policy towards economic and political refugees . There is no doubt that the young Afghan refugee Hamidoullah killed in the bomb explosion at Patissia and his little sister who is in danger of losing her sight suffered these due to the lack of asylum system in the country. We believe that there are political responsibilities, and we urge the Government to assume them to prevent such tragedies of innocent people from happening again. We wonder, how comes that suddenly all the ministries now show their “interest” for the family, offering gifts and promotions and making (false?) promises? Or is it that the government is only trying in this way to disguise their zero policy, which is implemented in the daily sweep operations, expulsions, hellish torture and detention of refugees and immigrants everywhere? We also wonder how comes that suddenly for all the media yesterday’s “illegal immigrants [lathrometanastes=clandestine immigrants]” are today’s “refugees”? We are refugees of a war that has been exported against us and we demand all the rights we are entitled to in accordance with international treaties on refugees. Those rights are: asylum for all refugees, protection of our lives, shelter for families and for unaccompanied minors, medical care for all etc. that the government stops playing the philanthroper and assumes its obligations towards refugees and immigrants. that particualr media stop disturbing the troubled and shocked family in the hospital and respect their situation. One more fatal shipwreck in the Agean. The coast guard found early today 8 bodies at the Potokakio area of Samos island. Yesterday, a Palestinian was rescued by a commercial vessel at the sea area near Turkey. He told the authorities that he had boarded on a plastic boat along with 10 or 12 more people and sailed from Turkey to Greece. Due to strong winds and rough sea the boat capsized. The weather conditions were so adverse that rescue and coast guard helicopters could not fly. The exact number of people missing is not clear since there is a probability that there have been more than one shipwrecks in the area in the last night(s). 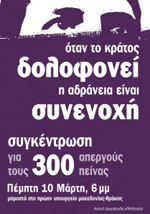 This is a Forum of Migrants in Crete press release. Labour accidents are tragic, shocking events. But what is more than shocking is what these people die of: inadequate protection measures. One more spectre that should haunt the sleep of state bureaucracies, trade union bosses, and the business world. Another worker killed, due to inadequate safety measures. We note that many immigrant workers have already lost their lives in a working regime verging on cruelty. We are not only talking about the labour intense and unsafe conditions, but also about the long shifts, the ridiculous wages and of course the uninsured status. It is the harsh reality, which the Greek politicians do not see and nobody refers to now that the new bill on citizenship and immigration is discussed. It is the hard fact that some Greek people refuse to see, entrenched as they are in insecurity and fear and the conviction that they have discovered the “enemy” of their wealth: immigrants. Yet, it is immigrants -uninsured and underpaid – who build their houses, who look after their elderly relatives and their household, who pick fruit from their fields, who do all those jobs that Greeks refuse to do anymore. We require that the state protects workers and implements the labour law. Let us not wait passively for the next “accidental death”. 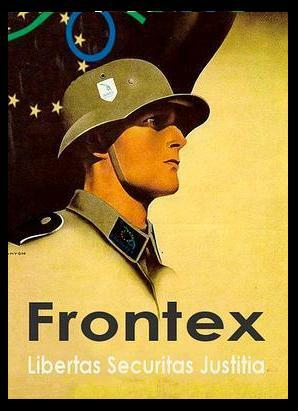 Greek and foreign workers, united, let us claim now everything that is ours. Let us push with our actions the employers, who we know very well will never show concern for us. No more deaths, no more crippled workers. A 26 year old Albanian lost his life when he fell from a height in Lasithi, Crete while running from a police check. The young Albanian who had no residence permit and would be deported took notice of cops in the night of Wednesday, Jan 20, and started running from them, since he had no residence permit and if arrested he would be deported. He climbed on a house’s roof but due to darkness he lost his balance and fell. The deceased had been for some months working in farms of the Makri Gialos area. A similar incident had happened in Heraklion, Crete, in September 2009. A young Albanian had seriously injured himself by falling from a great height to avoid a police patrol. The discovery of two more bodies early Sunday brought the death toll of suspected refugees who drowned along the Greek-Turkish border to 21, the Anatolia news agency reported yesterday. The first bodies, believed to be of people who failed in an attempt to cross the Maritsa, or Evros, River into Greece illegally, were discovered last Monday. It is unclear how large the suspected refugee group was and whether any of them made it across the river safely. Authorities believe the group tried to cross the river in a boat, but died under circumstances that remain unclear. The area around the Maritsa and the nearby Aegean Sea are popular routes for illegal immigrants trying to access the European Union. Thousands of illegal immigrants from Asia and Africa enter EU-member Greece every year, usually making risky crossings from Turkey in boats that are not seaworthy. Ten people died in October 2009 when a boat carrying Afghan families sank off the eastern Aegean Sea island of Lesvos. UPDATE JAN 8, EVENING: The number of bodies found so far has risen to 15. The date of the shipwreck is estimated to be the 29th of december. UPDATE JAN 6, AFTERNOON: Unfortunately, the number of dead bodies washed ashore is rising, 10 bodies have been found so far. THESSALONIKI, Greece – Police in northern Greece say six bodies have been recovered from the sea or have washed up on the shore following a suspected boat accident involving illegal immigrants. Their IDs were not found, reports said. Two bodies were found Monday and four at the weekend near Alexandroupoli, a city in northeastern Greece, near the border with Turkey.